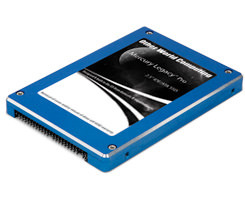 This is a 60GB Mercury Legacy Pro SSD 2.5" IDE/ATA 9.5mm Solid State Drive for the Powerbook, iBook and AppleTV. When only the fastest and most reliable Solid State Drive on the market today will suffice for your data storage and backup, look no further than the OWC Mercury Legacy Pro SSD. Near Instant Data Access: NO Drive Spin up...just lightning fast boots, loads, & access. Starts Fast/Stays Fast: NO Speed Degradation & 41X faster performance. More Rugged and Reliable: up to 100X more reliable than a hard drive.